1977 is remembered by me for a number of things, culturally, musically and personally. I grew up in reasonable comfort, the son of a postman and a school cleaner, with two younger brothers, in lower middle class suburbia. I was fortunate enough to have a room to myself, and, through the Direct Grant system in the early 1970s, I had a place at a minor (all male) private school as a day boy. Possibly because of my humble yet aspirational upbringing and my somewhat privileged education, coupled with the hormonal problems of adolescence, I found that I developed a tendency to be somewhat of a rebel. I didn't quite fit in to the world of my school contemporaries, and felt an increasing need to kick against 'the man'. The advent of punk was an excellent vehicle for that - it was a soundtrack to rebellion in the year of Jubilee (and our school's centenary). In Harrogate there was a small independent record shop, The Sound Of Music, which increasingly took up a lot of my time (and what little money I had) and gave me opportunities to explore the exciting new sounds that were appearing - as did John Peel's late night radio show. 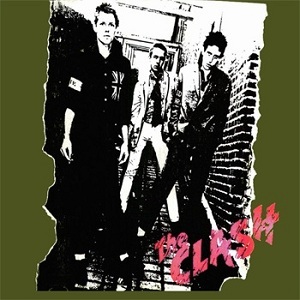 It was there that I sampled a plethora of punk, among which was the self-titled debut from The Clash. Here was immediacy, energy, anger, politics, anti-establishment angst, and lots of noise! This was new, this was raw, this was pumped up, and this was ours! It was a good time to be alive! That's kind of how it felt then, but how does it look and sound now? Well, as punk albums go this one does have a certain substance to it that some of the others lacked, though there is a lack of subtlety about the songs that, at the time, was endearing but now seems a little repetitive. The songs are, bar 'Police & Thieves', short - between 3:12 and 1:34 - and simple in structure and rhythm. The vocals are suited to the subject matter of the songs: direct, abrupt and earthy, and the musicianship is similarly to the point - nothing unnecessary, just raw (that word again) power. But that was punk, and these guys did it very well. Lyrically there is perhaps a little more depth than others were managing at the time, and there is certainly more about political frustrations here than there is about love. I was thinking that in terms of song length this is very much like an early Beatles album, but certainly not in terms of subject matter. As a commentary on its time and the social milieu of late '70s Britain this is a valuable and relevant piece of work, and can be appreciated as such. But subtle it is not!